The Daily Randi: Of Course, I Could Just Call It All "Vintage." Of Course, I Could Just Call It All "Vintage." Well, it was bound to happen eventually. As I was staring in my closet, trying to determine what to wear for My Date With Totally Awesome Boyfriend last weekend, it occurred to me: He Had Seen Me Wear All My Clothes. The Little Black Dress? Check! The Cute Little Top? Yup! The Splendid Summer Sundress? Uh Huh! That’s Right: I had Completely Depleted My Dating Wardrobe. Now, we all know, I am a girl with A Drawer Full Of Designer Duds, Dedicated For Dating Donning. I possess Fabulous First Date Dresses, Super Second Date Skirts and Terrific Third Date Blouses. If I Mix And Match, I can stretch The Fabulous Super Terrific Collection to maybe, Six to Eight Dates. In the past, I Very Rarely ever got to That Point when Dating A Boy. And once Someone New would enter the picture, I would just Start All Over Again with The Fabulous First Date Dress and No One Was The Wiser. But, Totally Awesome Boyfriend and I are Well Past Six to Eight Dates. In fact, we are So Far Past Six to Eight Dates that I Don’t Even Know What Date We Are On Any Longer! All I know is that Totally Awesome Boyfriend has seen me in Everything. Well, not Everything, I guess. There is That Pink Dress that I bought last summer. But, it Itches and I sometimes think it makes my arms look Fat. And I do have That Black Skirt, but it is Pouffy and I don't want to be doing The Pouffy Skirt Thing right now. And then I could wear Those Pants with That Halter Top but I don't think I have The Perfect Shoes to wear with That Outfit. And so, I am faced with A Dilemma: Rerun or Retail. Either I have to Wear Something Totally Awesome Boyfriend Has Seen Me In Already. Or, I Have To Go Shopping. 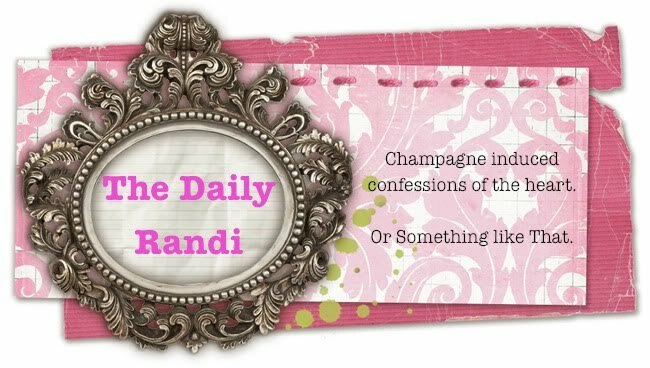 Now, I know many of you are probably thinking, "Um, what's The Big Deal, The Daily Randi? There is No Shame in wearing something Totally Awesome Boyfriend has seen you in already! Just Rerun!" And I Totally Agree. After all, if he Liked It The First Time, he will Like It The Second Time, too! And so, that night, I Reran! Just in case, I elected to go with a dress I had worn on The Fifth Date, figuring it couldn’t possibly be as memorable as What I Wore On Dates One Through Four. But, at the restaurant, when Complimented On My Attire by Totally Awesome Boyfriend, I Confessed that He Had Seen The Dress Before. “Well, I Love It!” he told me as we sat down to dinner. “You do?” I returned, suspiciously. “Oh, good,” I sighed. “Thank you.” I watched him scan his menu. Then, I noticed His Attire. He had on this Very Nice Striped Button Down. “ I Really Like your Shirt!” I told him. ha ha ha A match made in retail heaven!